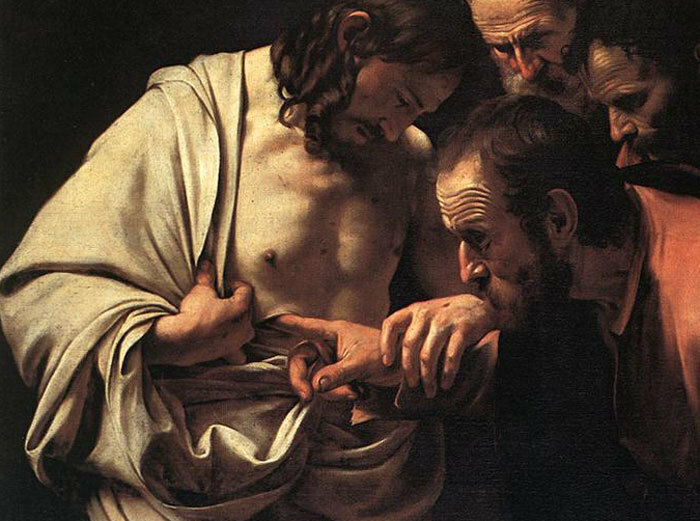 The story of Doubting Thomas (John 20:19-31) is not merely a story about a group of disciples who huddled behind locked doors that first Easter evening because they feared the authorities. This may be a story about you, if you have ever experienced significant disappointment in life. If you have watched hope evaporate; if you have felt life collapse around you; if you have suffered the death of a dear loved one or of a dearly held dream, this might be a story about you. If you have ever been fearful about life or so depressed you wanted to run away or hide in your bedroom and lock the door, this might be a story about you. If you have heard someone else describe a transforming experience of faith and have doubted it or wondered if such an experience could ever be yours, this could be your story. It’s also a story about the blessing that may be yours if your doubt is deep enough and honest enough. It’s interesting to me that the quality we most readily associate with the disciple Thomas is doubt. “Doubting Thomas” we almost universally call him. We don’t call him “Courageous Thomas,” even though when Jesus decided to go to Judea and the other disciples feared it would mean his death and theirs, too, Thomas was the one who said to them, “Let us also go, that we may die with him” (John 11:7-16). We don’t call him “Faithful Thomas,” even though his confession of faith, “My Lord and my God” (John 20:28), is the highlight of John’s gospel and the one place in all the gospels where the divinity of Jesus is forthrightly and unequivocally stated. We call him Doubting Thomas, I suspect – or at least I do – because in his doubting I find an example I can hold on to. I don’t feel his courage. I don’t know that I would be so willing and ready to die for my faith. And I don’t feel the clear, unambiguous faith he proclaimed. But I’ve known doubt, I’ve struggled with doubt, and I do even today, and that makes Thomas dear to me. I keep praying that hymn because I want that kind of faith, and so often the faith I have feels weak and uncertain, fearful, ready to compromise, ready to run away or hide behind locked doors, ready to escape to another world or another life. So I feel drawn to Thomas, the doubter, and to what his witness in the gospel says to me. From the experience of the disciples that first Easter evening, and especially from Thomas, I’ve learned that my faith neither isolates nor insulates me from the assaults and intrusions of the world, and it certainly does not dispel all doubt. I was baptized as an infant on Easter Day and have spent more than half my life in parish ministry, and still I wrestle in the dark, like Jacob at the Jabbok,2 with some “Traveler unknown, whom still I hold, but cannot see,”3 and I wonder, is it Love divine I grapple with, Love that will leave me limping for the rest of my life but blessed and with a new name? There’s a special place in my heart for Thomas, who tells me that my doubt may be precisely what leads me to my own experience of the risen Christ and to an honest expression of my true faith. So for now I’ll hold on, and keep wrestling with what life hands me, and keep wrestling with my doubts. And I’ll remember Thomas. Notes: 1. William H. Bathurst, “O, for a Faith That Will Not Shrink,” 1831. 2. See Gen. 32:22-32. 3. Charles Wesley, “Come, O Thou Traveler Unknown,” 1742, United Methodist Hymnal, no. 387.